In July 2015, Austrian organist Johannes Zeinler was awarded the First Prize in Organ Interpretation at the St. Albans International Organ Competition—the 23nd organist, one of the youngest competitors, and the only Austrian to receive this distinction since the competition and festival was founded in 1963. Born in 1993, he is currently studying organ with Pier Damiano Peretti and piano with Christiane Karajev at the University of Music and Performing Arts in Vienna. 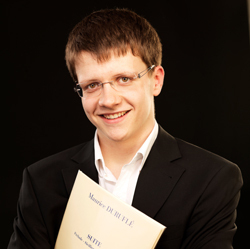 At the age of eigthteen years he was the winner of the 18th International Organ Competition for the Wiesbaden Bach-Prize in 2012, followed by First Prizes at the 4th Franz Schmidt Organ Competition in Austria 2012 and the Rheinberger Organ Competition in Liechtenstein 2013, each as the youngest competitor. Johannes Zeinler has been featured as a solo recitalist at the Carinthian Summer Festival, Wiesbaden Bach Wochen, Stifung Mozarteum Salzburg, and Jeunesse Festival in Vienna and, in March 2016 at the Barockschloss in Mannheim and at St. Peter’s Cathedral in Worms—both in Germany. As the newly appointed winner of St. Albans competition, Mr. Zeinler was heard in summer 2016 performances in Göteborg (Sweden), Eggenburg (Austria), Oxford (England), Chartres (France), Haarlem (The Netherlands), Edingurgh (Scotland), Orio (Spain), Aquileia (Italy), and Linz, Melk, and Klagenfurt (Austria). He will embark on concert tours in the United States during the 2016–17 and 2017–18 seasons. Mr. Zeinler will be on tour and available for bookings from April 23–May 7, 2017 and October 1–15, 2017. Johannes Zeinler is represented exclusively by Phillip Truckenbrod Concert Artists, LLC.